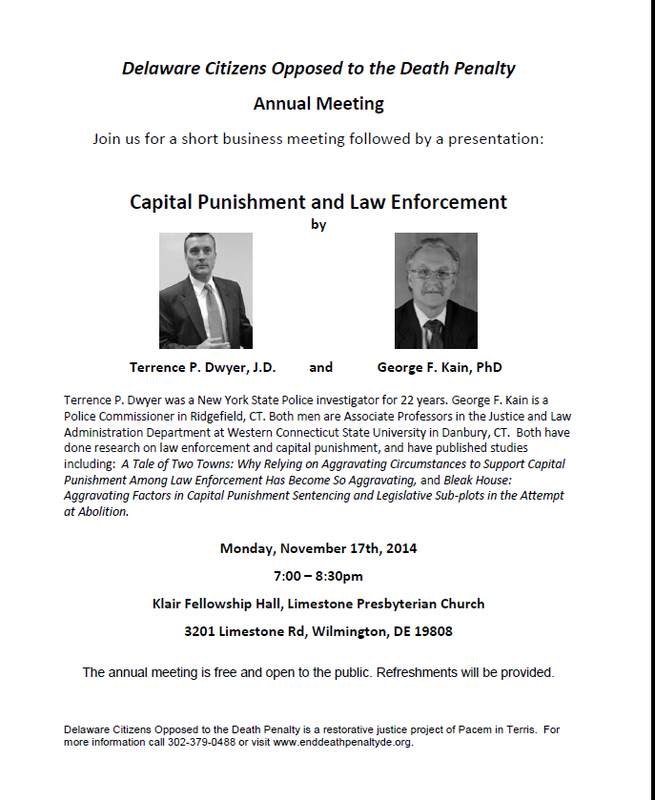 Join us at our Monthly DCODP Meeting as we plan to repeal Delaware’s death penalty in 2015. Find out what you can do to help end Delaware’s ineffective, costly, and biased death penalty. Monday 10/27/14 at 5:30 pm. LOCATION: Wilmington Friends Meeting House, 1st floor Social Room, 401 N. West St, Wilmington, DE 19801. Park in the parking lot on the 5th Street side or on the street. Ring the doorbell at the West Street entrance. Call 302-379-0488 for info. All are welcome! Invite a friend! The Delaware Repeal Project (DE Repeal), a coalition of 29 partner organizations in Delaware, educates Delawareans about the problems of the death penalty system and leads the campaign to repeal the death penalty in the state. The coalition was founded in 2011 as a partnership with Delaware Citizens Opposed to the Death Penalty (organizing and educating about Delaware’s death penalty for over 20 years), the League of Women Voters, the Delaware Center for Justice, the American Civil Liberties Union of Delaware, the NAACP and Pacem in Terris (a local peace and justice organization). A bill to repeal the death penalty passed in the Delaware Senate in 2013 and died in the House Judiciary Committee in 2014. The campaign and its many allies are setting the stage for quick passage of a new bill in the 2015 legislative session. There is strong bi-partisan support, including from conservative Republican legislators remaining true to their Catholic faith. More than 140 faith leaders have added their names to a “Clergy Sign-on letter,” and those who have not yet done so may add their names here. DE Repeal is focusing on expanding the coalition and grassroots support. To this end, the organization attends festivals and fairs throughout Delaware and regularly engages the faith community. “Death Penalty Awareness Days” are scheduled from November 14-23, 2014, providing two weekends in which clergy are asked to preach on the issues and mobilize worshipers. Town Hall meetings will take place in various parts of the state on November 18, 19 and 20. Details on these events and the Death Penalty Awareness Days will be posted soon at www.DERepeal.org. One of the featured speakers at the upcoming Town Hall meetings will be John Breckenridge, a retired police officer from New Hampshire whose partner was murdered as they investigated a disturbance. Breckenridge originally supported the death penalty for the killer; however, in time and with a return to his Catholic faith, he has come to forgiveness. He now advocates for an end to the death penalty. Catholics and others ready to help end the death penalty in Delaware are urged to sign up with the DE Repeal Project at www.DERepeal.org and to ask their state Senator and Representative to support a bill to repeal Delaware’s death penalty. Legislative Advocacy can begin now and will be very important when the legislative session resumes in January, 2015. The Delaware Repeal Project seeks volunteer “captains” to assist in local organizing, leading the effort within their Parish, and/or helping to ensure that many Delaware Repeal supporters are at Legislative Hall in Dover on lobby days and on days when the bill will be voted on. For more information and to get involved, contact ti@derepeal.org. To read the full issue of Catholic Mobilizing Network’s newsletter, click here.